The guys over at MobileFun have kindly sent me an Official Samsung Galaxy Note flip cover for my Galaxy Note, so I thought I'd give it the once over for you guys out there who might be looking for some protection for your awesome phone (again, phone :P). The case itself consists of a replacement back cover and a front cover made of synthetic material. Samsung like this type of material on their official cases, and if you've ever seen the official book case for the Samsung Galaxy Tab 10.1, you'll be familiar with this material. It's not leather which may disappoint some people, but it has a nice feel to it and is slightly textured making it feel high quality, and expensive (which is important). As mentioned above, this case actually replaces the back cover of your Note. It clips in just like the stock back cover (well actually, it is a bit easer to clip into place than the stock cover), but is slightly thicker and as such slightly heavier. But only very slightly, the biggest advantage I can see to the extra thickness is that the rear camera now sits under the case slightly meaning that when the phone is laid on a flat surface the lens cover does not touch the surface! This is great for those of us (me included) who love taking pictures with their smartphones and don't want any damage to occur to the lens cover. As far as I can tell the back cover on this case is made out of the same material as the stock back cover. It also contains the same Samsung logo, Â you'd be hard pressed to find anyone who could tell this isn't the stock cover just from looking at it. Where as the front of the case is made of the leatherish synthetic material Samsung likes, the read of the front cover is a bit softer, almost padded really, which helps to ensure that the screen is protected from any harm. The front cover leaves a small slit for the earpiece, which means you can actually hold a phone call with the case closed.. It's kind of strange, but shows Samsung have put thought into the use of this case. It also makes the front look a bit cooler which is always good! You can flip the front cover all the way round the back of the phone. This is great as one of my pet hates is a cover flapping about when you're trying to send a text, or grab that last golden fruit on Angry Birds. However, this feature also leads me onto the one negative I have with this case. The front cover is free to flap about as much as it likes. There is no magnetic or physical clip keeping it in place when resting. This means that after about the first 5 minutes of using the case, the front will never again stay truly flat against the front of the phone. It just lifts up slightly. You can check the photos in the gallery attached to this post to see what I mean. I haven't had a great deal of time with the case yet so I can't comment on if this will get any worse, but its something to bear in mind. 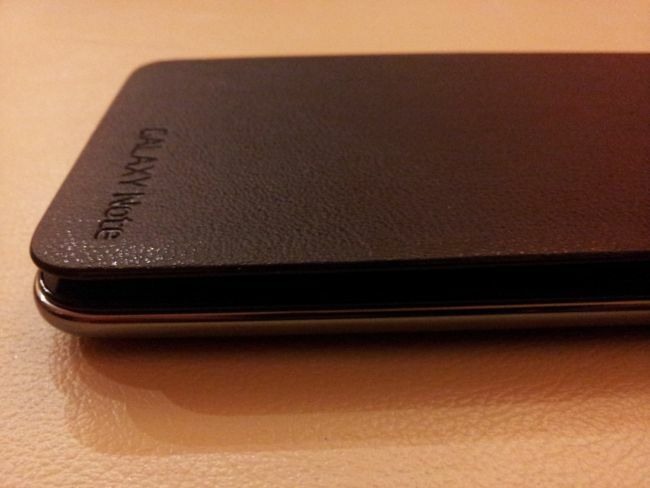 However, this is still a fantasticÂ Galaxy Note case, and definitely one of the better ones out there for sure. It's not too expensive, and a lot cheaper than a real leather case you might find. I'll be using this case on my Note for the time being at least!